The Benelli Mojave is an endangered species. In the 1960s, it was virtually disposable, and sold by a chain of department stores. But today it’s prized by the motorcycling equivalent of big game hunters. 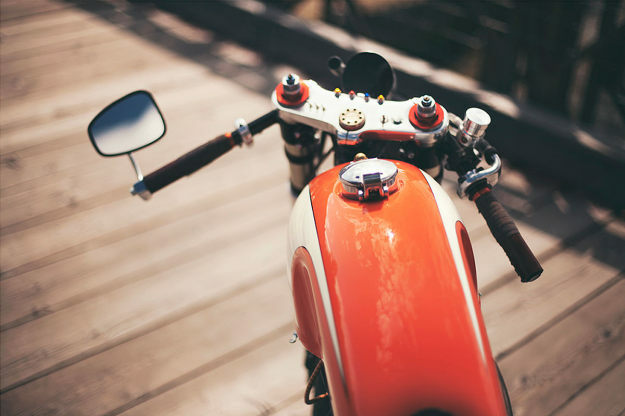 They’re after one vital component: the Mojave’s immaculately proportioned, café racer-style tank. 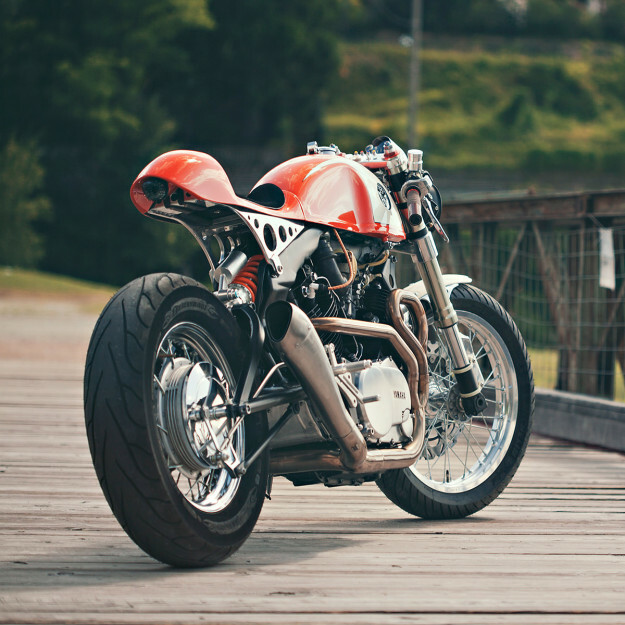 And the best place to show off that tank is on the frame of a Yamaha Virago. 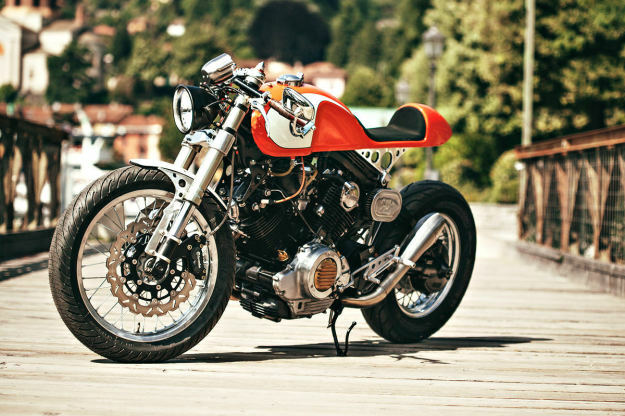 Virago customs are two-a-penny these days, but this XV 750 is something special. 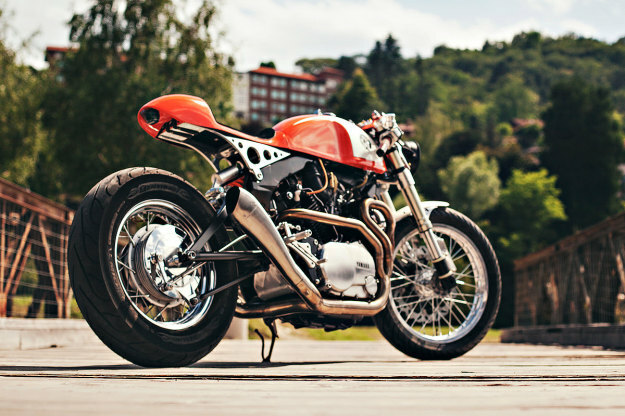 It’s the work of Italian Christian Moretti, who runs Plan B Motorcycles and has an eye for a good line. Christian reworked the frame to make the tank sit lower, and built a new tail unit from scratch. The visual flow of the bodywork is now worthy of any factory stylist. The mechanical side is more than up to scratch, too. The 43mm Showa forks are from a Ducati 916, and installed with custom yokes to ensure the correct rake and trail. The shock is also Showa, but this time from a Yamaha R1. And a reinforced swingarm improves the handling even further. It may seem strange to retain the drum brake at the back, but it looks good. And up front, a 320mm floating disc with Brembo calipers provides plenty of stopping power. 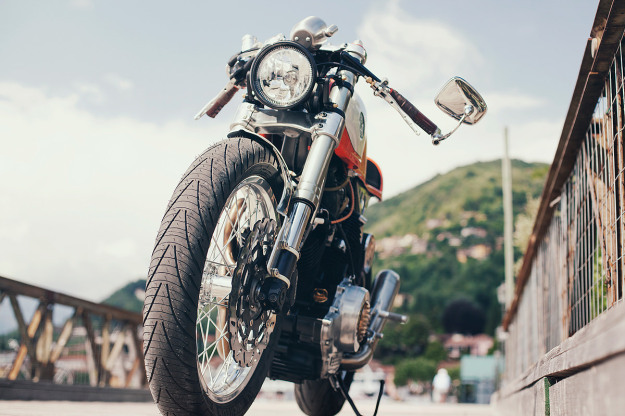 The wheels have been converted to spokes—and dropped an inch in diameter, down to 18” at the front and 15” at the back. 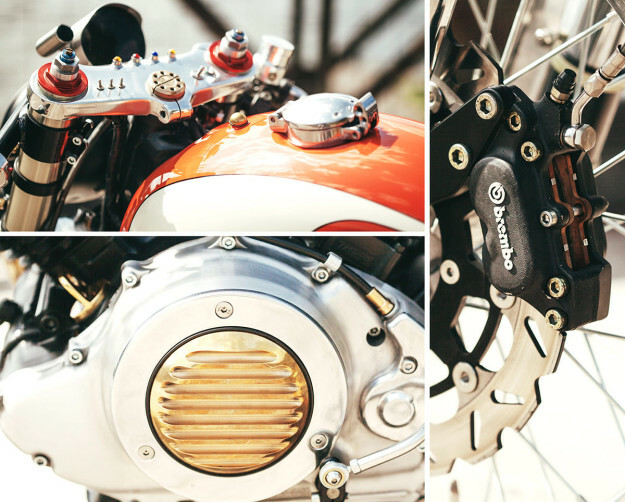 A bobbed Triumph Thruxton fender and clip-on bars add to the deportivo flavor. The sinuous exhaust terminates in a pair of stunning HP Corse Hydroform mufflers. But we reckon the highlight is the orange paint—a Porsche color from 1973. It looks just perfect on that tank, doesn’t it?